I am aware that there are answers regarding this but they do not seem to answer it for me. A few years back I got a Acorn Electron and it works using the arial for video fine, but I would like to connect it to my monitor which has a VGA & HDMI input. 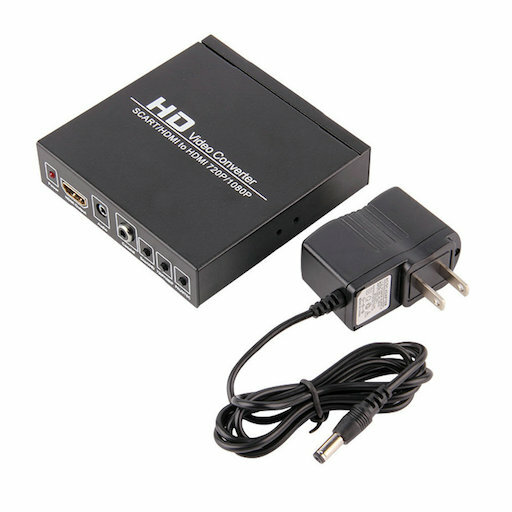 Is there a cheap converter or cable I can buy without me having to make something to convert one of the outputs on the electron to VGA/HDMI? The Electron outputs an analogue interlaced 625-line image, with a line rate of 15.625Khz. HDMI is a digital input, so cannot comprehend the Electron's analogue output. VGA is analogue but many monitors expect a line rate of 31 kHz. It's not impossible that your screen would be okay with 15.625Khz though, as that's the PAL standard, so you could at least have a try. The pinout of the Electron's monitor port is here and a passive cable would work if your screen is compatible. I guess you'd need something like this, this and this. Failing that, you'll need a scan doubler, which does exactly what the name says, taking a 15.625Khz input scan rate and outputting 31.25Khz, which is within the range VGA screens expect. You can get this model from a bunch of different eBay sellers, under various different brand names, but they're all the same. I've tested it out with MODE 0 - MODE 6, and it seems to consistently work well. It also works well with my BBC Model B The only time I've seen it fail is when playing Firetrack on the Electron, which does some tricky stuff with the video output to get more colours. Not the answer you're looking for? Browse other questions tagged graphics video acorn vga electron or ask your own question. Do all VGA cards implicitly support CGA and EGA?